“Public health” oriented licenses and patent pooling in Africa promotes research and production of affordable, high quality generic treatments for AIDS, hepatitis C and tuberculosis. The United Nations Sustainable Development Goals highlight the need to increase access to essential, high-quality, safe, effective and affordable medicines for all, a major public health challenge for African countries. Three specific diseases have major impact on the economic and social development of Africa: namely HIV, hepatitis C and tuberculosis. These three diseases represent a significant public health burden in low-and middle-income countries generally and in Africa in particular. 26.6 million people are estimated to be living with HIV in Africa, many of whom acquire tuberculosis, which remains the leading cause of mortality among people living with HIV. It is estimated that there are 2,720,000 new cases of tuberculosis every year in the African continent. With respect to hepatitis C, despite the new direct acting antivirals with cure rates exceeding 90%, only about 6% of people with hepatitis C in Africa have been tested for HCV and only 2% of those diagnosed with HCV have started treatment. To address many of the innovation and access challenges relating to diseases that disproportionally affect developing countries, the World Health Assembly approved the Global Strategy and Plan of Action on Public Health, Innovation and Intellectual Property (GSPA) in 2008. In the strategy, Member States agreed to promote new thinking in innovation and access to medicines, which would encourage needs-driven research to target such diseases. This is the case, for example, with patent pooling and voluntary licensing, tools on which Medicines Patent Pool has based its approach. The Medicines Patent Pool (MPP) was established in 2010 with the financial support of UNITAID, the innovative financing mechanism hosted by the WHO, to promote access to new patented HIV medicines in low and middle-income countries through voluntary1 licensing and patent pooling.2 The MPP negotiates licence agreements on HIV, hepatitis C, and tuberculosis medicines with patent holders. These licences allow generic pharmaceutical companies to manufacture and distribute patented medicines in developing countries. Competition between low-cost manufacturers brings prices down. The licences also provide the freedom to develop new treatments such as fixed-dose combinations and formulations adapted for children. The MPP model (see diagram) works for all stakeholders. Patent holders have an effective way to share patents on their products in resource-poor settings and may be compensated by royalties. Generic manufacturers are able to produce affordable new medicines more easily and rapidly. Donors and developing country governments are stretching their budgets further to treat more people. And people living with HIV, tuberculosis and hepatitis have more rapid access to the medicines they need at affordable prices. The public health oriented terms and conditions in MPP licence agreements seek to improve treatment options for the broadest number of people living in low and middle-income countries. The provisions include wide geographical scope; non-exclusive licences to encourage generic competition; compatibility with the use of TRIPS flexibilities related to public health; waivers for data exclusivity protection; disclosure of company patent information; and unprecedented transparency. The full text of all licences is published on the MPP website. The commitment from pharmaceutical companies (originators and generic) to work with the MPP has been key to improving access to new HCV and HIV drugs. The commitment from pharmaceutical companies (originators and generic) to work with the MPP has been key to improving access to new HCV and HIV drugs. To date the MPP has signed agreements with nine patent holders for twelve HIV antiretrovirals, two hepatitis C direct-acting antivirals, and one tuberculosis treatment. Its generic partners have distributed 12.9 million patient-years of WHO-recommended HIV, hepatitis C and tuberculosis medicines to 131 countries. The MPP has signed licensing agreements with AbbVie, Bristol-Myers Squibb, Gilead Sciences, Johns Hopkins University, MSD (Merck & Co in the USA and Canada), Pharco Pharmaceuticals, Roche, ViiV Healthcare, the University of Liverpool and the US National Institutes of Health. The MPP has also sublicensed to 20 generic manufacturers and product developers who are currently developing, producing, registering and supplying medicines at a lower cost. The MPP’s licences allow generic manufacture of patented antiretrovirals (ARVs) recommended by the WHO for first- and second-line treatments3 for adults and children of different age groups. All countries in Sub-Saharan Africa are included in MPP’s licences. Licences also include new promising ARVs that likely will be central to treatment in the future. For example, the MPP is also working with its manufacturing partners to ensure the most recent HIV medicines, such as dolutegravir (DTG) and tenofovir alafenamide (TAF) become available rapidly in developing countries from multiple manufacturers. DTG is considered a major advance in HIV treatment and is already a part of 1st line treatment recommendations of the WHO . 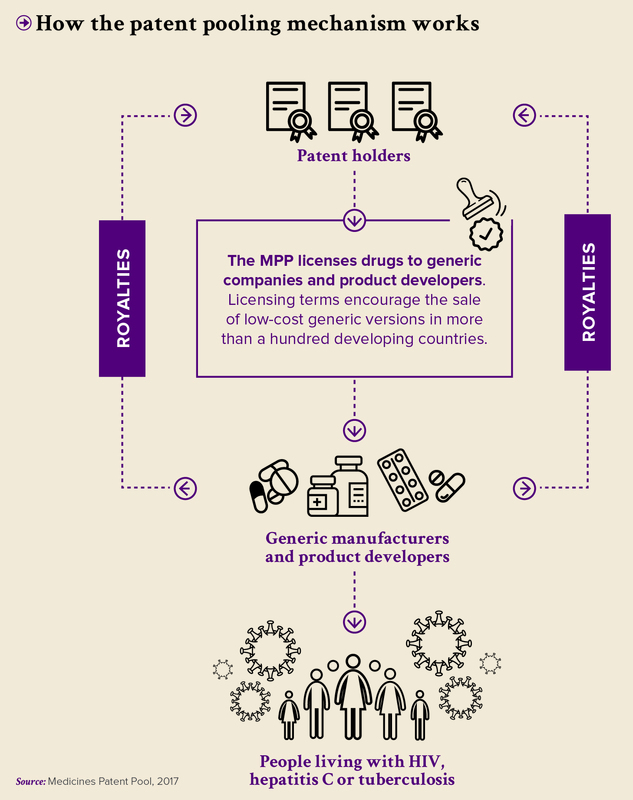 MPP licences enable the manufacturing of generic ARVs and their sale in countries where between 87 and 91% of people with HIV in the developing world live. This includes all low-income countries and 50-80% of World Bank classified middle-income economies. The inclusion of public health oriented terms and conditions is a key distinctive feature of MPP licences. The Access to Medicine Index (ATM Index) that analyses 20 of the world’s largest research-based pharmaceutical companies on their commitment to making medicines, vaccines and diagnostics more accessible, has recognised the terms and conditions of the MPP licences as being pro-access, flexible and broad in geographical scope. The MPP is currently managing more than 100 pharmaceutical development projects with manufacturers to help speed availability of quality-assured generic versions of new treatments, including new fixed-dose combinations. Sublicences with generic manufacturers and product developers are already enabling the development, manufacturing and sale of HIV and hepatitis C medicines in a large number of developing countries. The MPP licences provide the freedom to develop new treatments such as fixed-dose combinations – single pills composed of several medicines – and special formulations for children. Licences from multiple pharmaceutical companies via the MPP have enabled the development of the new first line HIV fixed dose combination, namely the combination of tenofovir disoproxil fumarate/lamivudine/dolutegravir, which was approved by the US FDA in August 2017 . This is a new combination that will likely revolutionize HIV treatment in countries most affected by the epidemic, such as those in sub-Saharan Africa. In view of the multiple manufacturers working on its development, it is expected that the new formulation will not only offer a more effective and better tolerated treatment, but will also be available at more affordable cost than the currently used first-line treatment, enabling HIV treatment budgets to go further and treat more people. The Medicines Patent Pool also engages partnerships with key stakeholders for innovation in other areas, such as the development of new paediatric HIV formulations and the development of new regimens for the treatment of multi-drug resistant tuberculosis. Recently, the WHO and the Lancet Commission on Essential Medicines Policies recommended that consideration be given to the expansion of the MPP’s patent pooling model to all patented essential medicines. Currently the MPP is exploring the feasibility, desirability and potential public health impact of expanding the patent pooling model to all patented essential medicines. Public health oriented licensing and patent pooling can play a key role in promoting innovation and access to meet the needs of African countries that are mostly affected by the HIV, TB and HCV epidemics. The MPP model is working in HIV, TB and HCV and has the potential of meeting access challenges in other disease areas. The MPP is unique in its approach to partnering with a range of public health actors, including the pharmaceutical industry and other stakeholders in the field of HIV, hepatitis C and tuberculosis, to support better access to essential drugs in Africa and in other developing countries. It is also offers a mechanism to facilitate further innovation to address specific formulation needs in developing countries. The Medicines Patent Pool’s work depends on collaboration and its partnerships with patent holding companies as well as with the generic manufacturers are critical to its success. 1 Patent holders may, at their discretion, grant other stakeholders exclusive or non-exclusive licences to manufacture, import and/or distribute a pharmaceutical product. 2 The idea is to pool patents, often held by different owners, so that their exploitation rights can be offered simultaneously in a single licence. 3 In resource-limited countries, treatment regimens are simplified, standardized and grouped under two effective options to be used one after the other (first and second line or first and second intention). World Health Organization, 2017. Global hepatitis report, 2017. Burrone, E. et Perry, G., 2015. Ensuring new medicines reach those in most need. Lancet HIV, 09/2015. The Lancet, 2016. Commission“Essential Medicines”. Available at:http://www.thelancet.com/commissions/essential-medicines.